What’s the worst part of the travel experience? Take an informal poll and you’ll find “going through security” to be in the top three, if not number one. 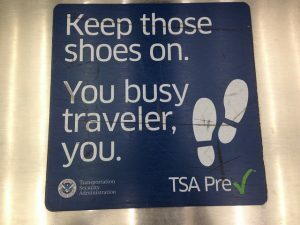 Since 9/11, Americans have developed strategies for removing their shoes, unloading their laptops, and shrinking their toiletries to three ounce travel sizes in order to streamline their security screening. What if you could skip all that rigamarole and stroll through security without removing anything? You can, and The Transportation Safety Administration (TSA) wants to tell you how. While many frequent business travelers are familiar with Precheck, TSA is on a campaign to get more travelers to sign up. The process is relatively simple: you fill out a form online and schedule a brief, in-person interview at the airport where you present the required documentation (a passport, driver’s license, or birth certificate) and are fingerprinted. The $85 fee provides Precheck security clearance for five years. While that fee may seem like a hurdle, TSA would like travelers to consider the often overlooked intangible value of time saved as they think about Precheck. The administration has partnered with credit card companies, airline loyalty programs, and travel agencies to try to make the most of its meager marketing budget to spread the word. David Lim, executive advisor to the TSA’s office of the chief risk officer, believes that it’s logical for loyalty reward programs to push participation. “Loyalty program perks promise a seamless travel experience, but that gets blunted with a problem at the security checkpoint,” Lim said in a recent Skift.com article. One marketing technique TSA has recently implemented is randomly selecting travelers to experience the efficiency of Precheck by upgrading their boarding pass. It’s hard to deny the benefit of having it once you’ve experienced it. Still, TSA would like to see more companies adopt this time management tool for their employees. Are you a PreCheck user? Has it been worth it? Or do you have any questions about PreCheck? Let us hear from you. Leave a comment below, on our Facebook page, or in our Twitter stream.